Today I’d like to share a cute card that you can whip up with just a couple of punches and a fun embossing folder! Easy right! Cute too! Those of you who have stamped with me for a while, know that I love to layer color on color … today it’s white. 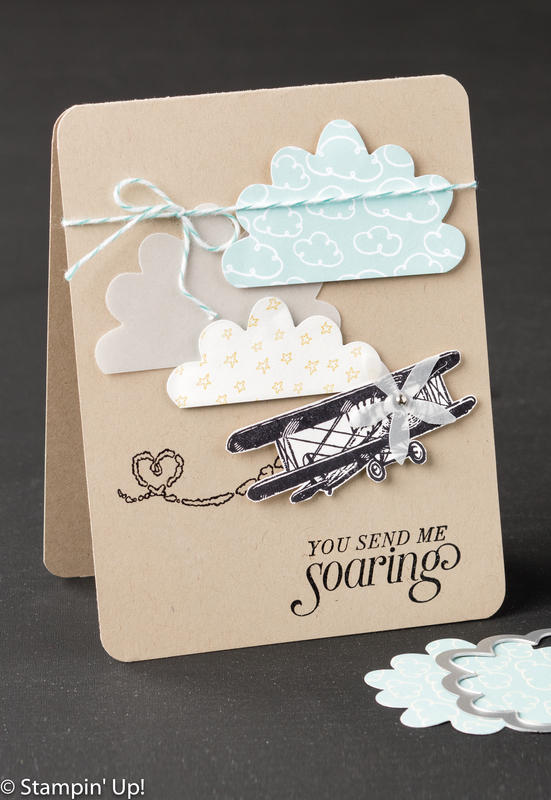 Layers on a card just add that extra touch … a little more love. The first thing I did once I decided to do the white on white, was emboss the top layer with the “Lovely Lace” embossing folder. I like to combine my punches to create even more layering – it adds depth and dimension to the card. Here is used the “Petite Petals” punch on the Wild Wasabi, Rose Red and Island Indigo cardstock… this flower is the perfect size to highlight so many other stamp sets and projects. I then added the little white flower – punched from the “Itty Bitty Accents” Punch Pack and topped it off with a rhinestone. I liked it … but wanted a bit more color so I added a mat in Rose Red and White – that really popped my flowers. Awe … and you couldn’t find a better greeting to send some flowers to a friend than “because you’re awesome”. This comes from the Sale-a-bration stamp set “Botanicals for You”. 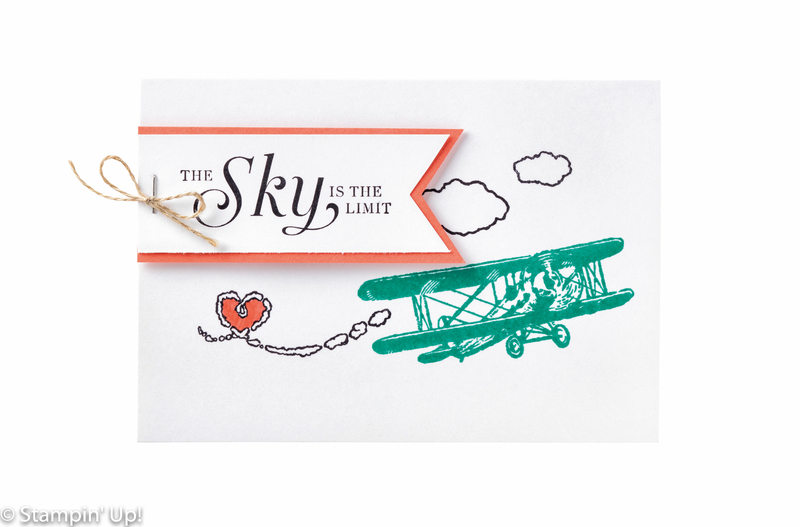 You can get this stamp set for free with a qualifying order of $50 (before shipping & handling). I did hand cut my banner ends but you could easily use the “Triple Banner” punch. I use it all the time except when I let my sister use it to complete the extra packets of cards from my Catalog party. 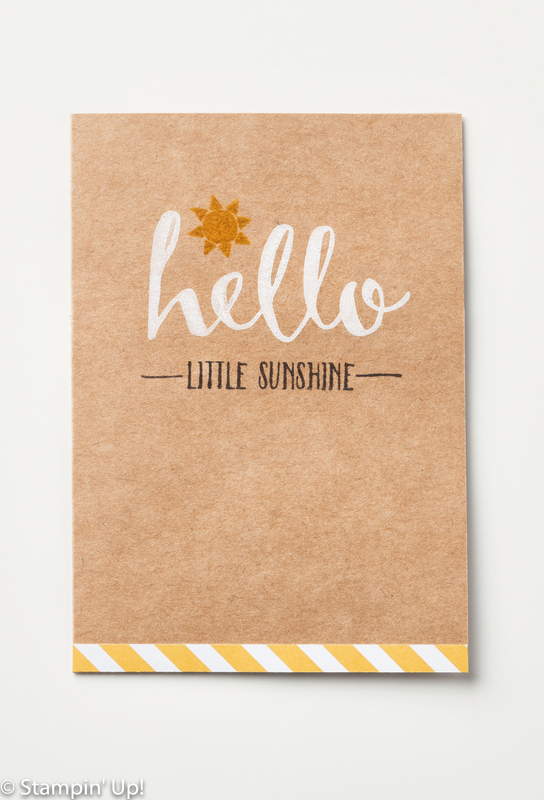 Hope this quick -n- cute card inspires you to whip up a few cards for yourself. Have fun and enjoy your weekend! Who wants a hug?? Bear Hugs that is! It’s Friday … Wooooooooooooooooo Hoooooooooooo!!! Just a little excited to see the weekend on it’s way! Today I want to share a “hug” with you … A bear hug! If you haven’t fallen in love with this stamp set you will, and it has a coordinating framelit set. This is an awesome bundle! Always great to see stampin’ tips from the home office at Stampin’ Up! I love watching the videos, it’s just like coming to one of my classes … well almost. They don’t have my snacks and chocolate from the Candyman!! I’ll be sharing some of the fun we had at our Occasions/Sale-a-bration Stamp Camp where there was plenty of chocolate and snack food… and yes, cards! Lots of cards! Thanks for dropping in on me today. Hope you Friday is an awesome one!! During Stampin’ Up!’s annual Sale-A-Bration event, you earn FREE Sale-A-Bration rewards for every $50 you spend on Stampin’ Up! 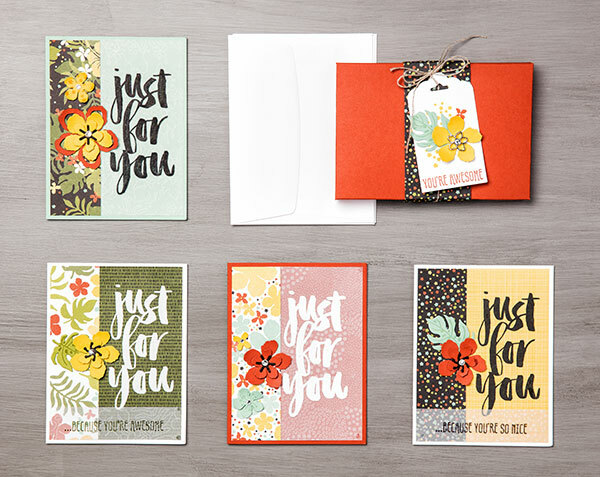 products, including the very diverse Botanicals for You Stamp Set and Botanical Gardens Designer Vellum Stack—two of our favorite Sale-A-Bration products! One of the things that makes these products so cool is that they coordinate perfectly with the Botanical Gardens Suite from the 2016 Occasions catalog. Arrange all of these products together in a semi-organized way and you’ll come out with a set of four fantastic cards, as well as a nifty card holder. Life is good during Sale-A-Bration! Contact me lindaluvs2stamp@aol.com anytime before March 31st to learn how you can get your hands on these tropically-themed products. Hoping your day is a beautiful one. 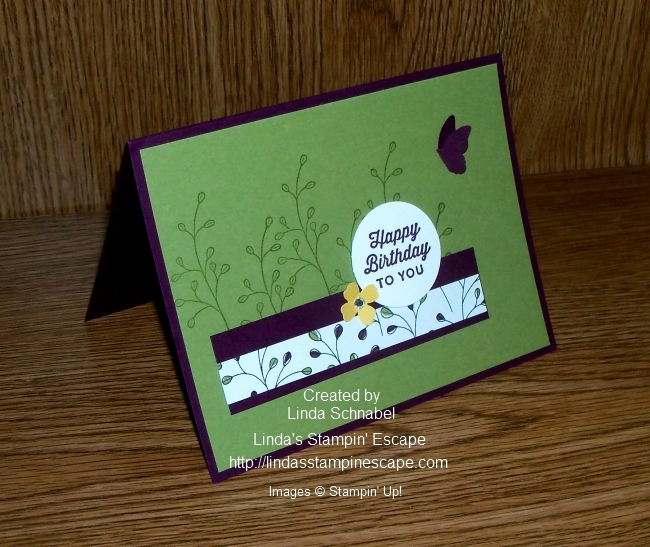 Today I have a card that I created with one of our Sale-a-bration stamp sets … Flowering Fields! I actually won this stamp set at our “On Stage” event – delivered by our “Prize Patrol”. I simply love this color combination … Old Olive and Blackberry Bliss. I stamped a simple background on the back and then added the strip of designer paper. 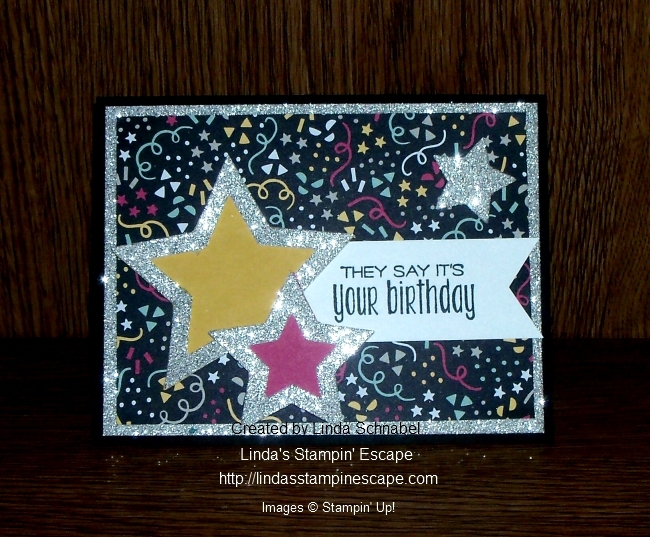 Our birthday greeting comes from the stamp set “Sunburst Sayings” from the Occasions catalog and is stamped in the Blackberry Bliss. To draw your eye to the greeting and add a pop of color – I punched out a flower from the “Itty Bitty Accents” punch pack and highlighted with a rhinestone. Then to balance the card out, I added my “Bitty Butterfly” and folded it in half to create more dimension and so it appears as if it’s in flight. 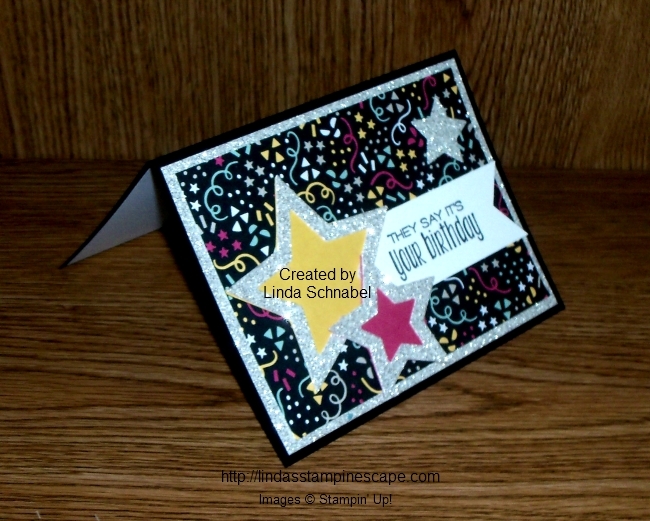 A cute simple card created with two of the items you can get free in the Sale-a-bration catalog. Remember with each $50 purchase (before shipping & handling) you can choose one item out of the catalog. Have yourself a very special day! Just a quick post today to share the Weekly Deals with you! Looks like I will be adding some ribbon to my order!! I love ribbon, I think it’s an inexpensive embellishment for my cards and scrapbooking and it adds that finishing touch, so when it’s on sale … I stock up!! Thanks for checking out the Weekly Deals. 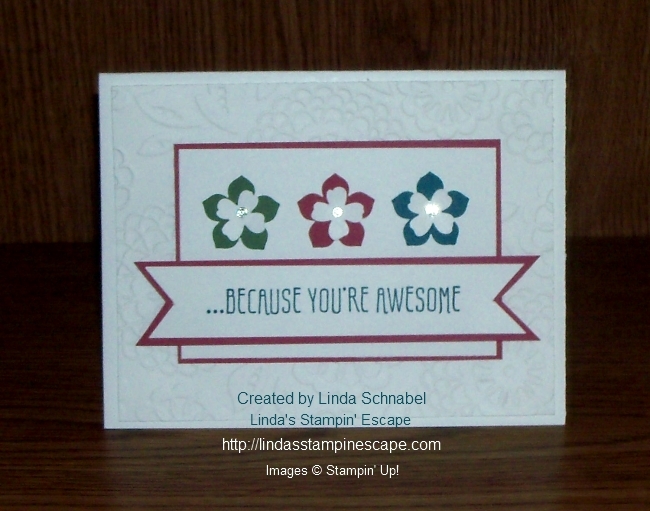 I’ll be back tomorrow with another beautiful card share that features one of our Sale-a-bration stamp sets! I hope you have time to enjoy a wonderful weekend! We were busy cutting and packaging all the make & takes for the New Catalogs Kick-Off party. Today I’ll be doing the baking … can’t wait for my guests to see the cards!! 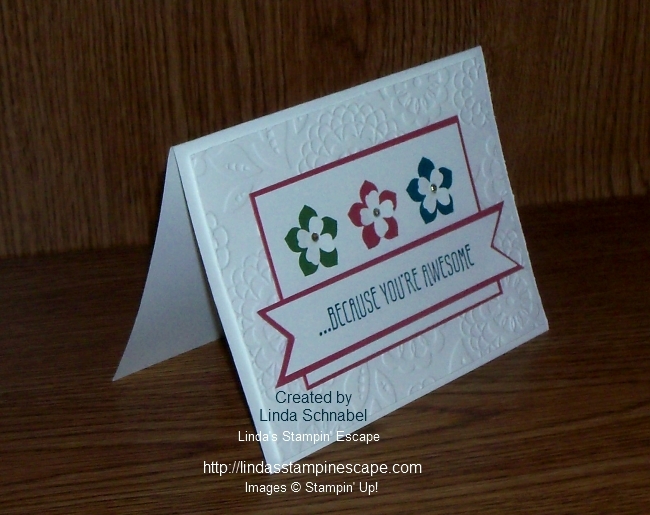 Today I want to share a couple of cards created by Stampin’ Up! and to remind you these awesome stamp sets are only available through January 15th … they are our Sale-a-bration items and you can earn them FREE! Whether our Sale-A-Bration event is brand new for you, or this is your umpteenth year Sale-A-Brating, here’s some information that will help you enjoy this exciting annual event. Shop: for every $50 your customers spend, they’ll get a FREE exclusive Sale-A-Bration reward-they’ll get to choose from several brand-new products that are available only during Sale-A-Bration! Join: When customers join Stampin’ Up! as a demonstrator during Sale-A-Bration, they get to choose an additional $30 worth of product for their starter kit-that’s $155 of products for only $99! I love this stamp set, we’re always looking for man cards and this one fits the bill … and I think it’s a pretty cool set for a graduation as well. You can coordinate this stamp set with “Going Global” from the Occasions Catalog or “Traveler” from the annual catalog. 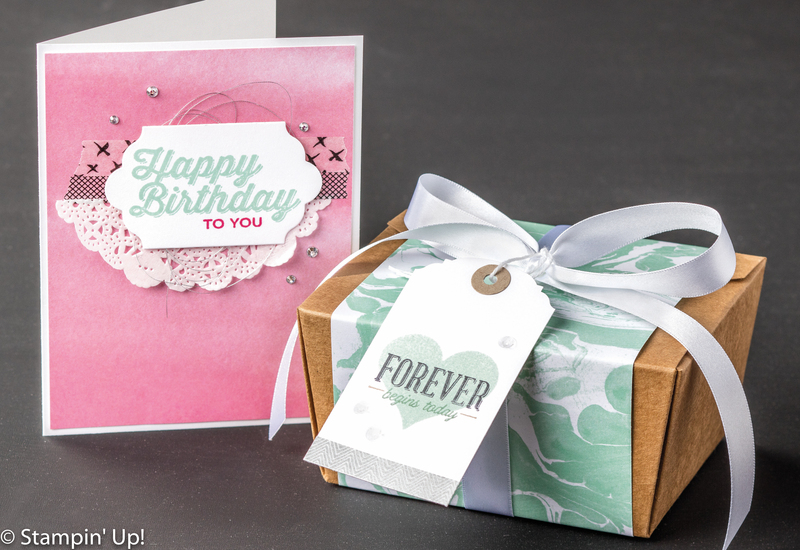 This stamp set is perfect for quick and easy cards! A little watercoloring and some butterfly punches and you have a beautiful card. How sweet and simple is this! You can always step it up by adding some designer paper … that will really make the card pop all while keeping it simple. In fact, our beautiful “Perfectly Artistic” Designer paper is also on the Limited time products, and you can see it here on these two projects. Hope you enjoyed a closer look at our Limited Time products … time is going quickly so if you are interested in getting any of these items, feel free to contact me. 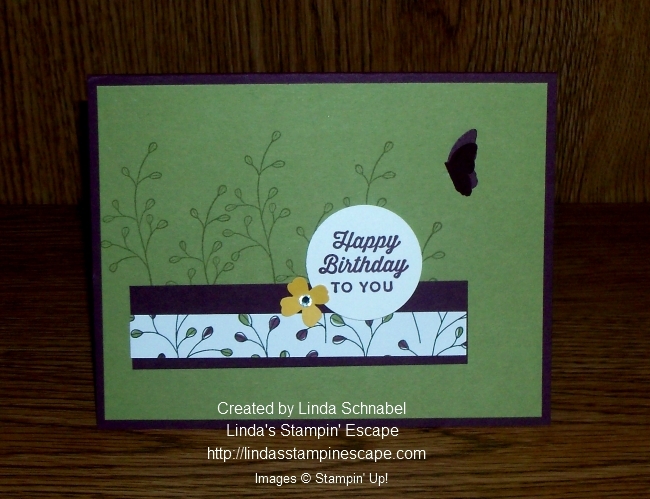 lindaluvs2stamp@aol.com You can begin your shopping experience by clicking here. DOREEN … Congratulations on WINNING the Blog Candy. Please notify me by WEDNESDAY with your information so I can send it to you. Simply Sunday: They Say It’s Your Birthday! Today I have a cute birthday card to share with you and it is much easier than it appears! I started with the “It’s My Party” Designer Series paper. 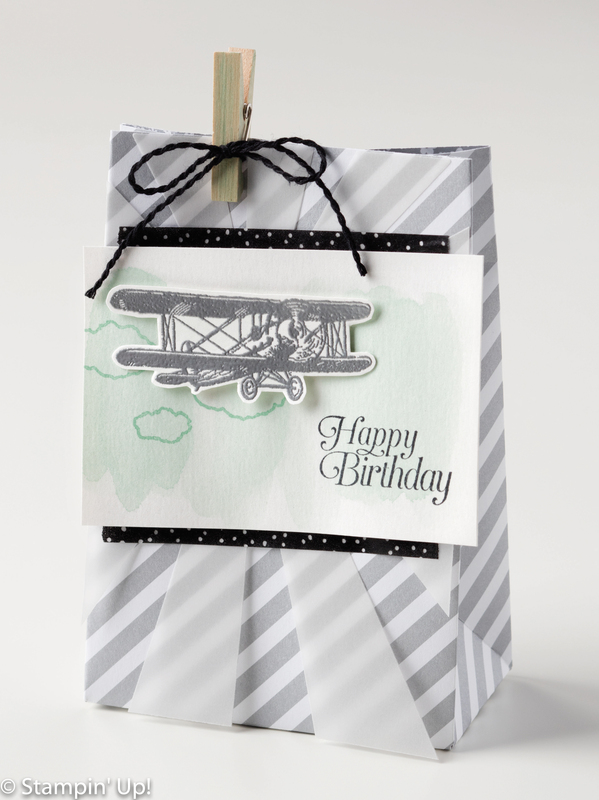 Designer paper is my “go to” stampin’ supply when I need a quick card. It takes all the guess work out of choosing color patterns … it’s done for you. I decided I wanted to go Basic … Black that is for my card base, then Melon Mambo and Crushed Curry for my pop of color. I really wanted my card to be special so I added the Silver Glimmer paper. I knew I wanted to highlight the stars in the designer paper so I pulled out my “Stars” framelits! The ease of this card and how I cut my 3 stars was to layer all 3 stars inside of each other! AND … I did that from the silver glimmer paper that is now the mat behind the designer paper. Once you have your 3 stars (2 smaller ones inside the largest) layered on your paper, run them through the BigShot. Follow up by cutting the two larger stars out in the colors you desire. I used the Crushed Curry for my largest star, then Melon Mambo for the middle size star. Now attach the colored stars to the back of the glimmer stars … I used glue dots, they work great without making a mess. I come from the “Beatles” generation so when I say the “They Say It’s Your Birthday” … I just had to get the “Suite Sayings” stamp set! There are so many nice greetings for all different occasions, you’ll surely want to add it to your collection. I finished my greeting by creating a banner with the “Triple Banner” punch. 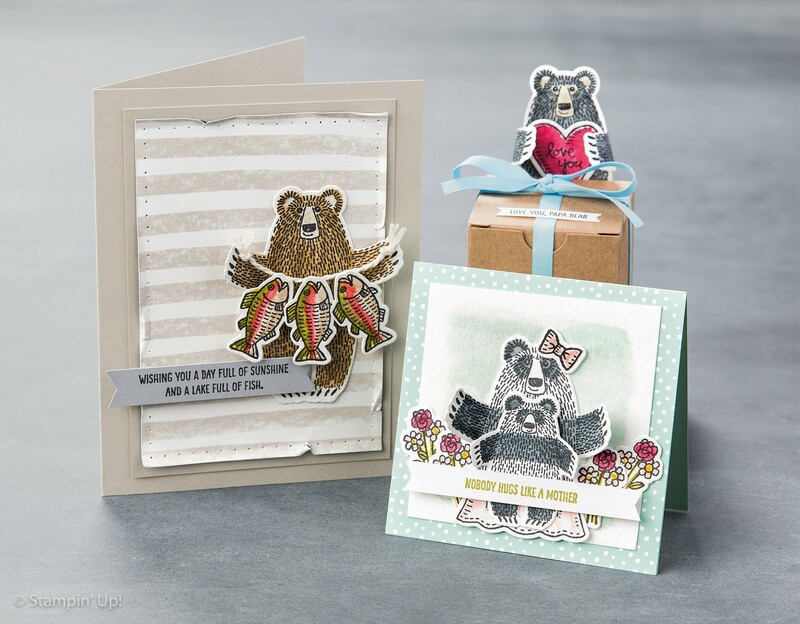 You don’t have to stick to the annual or occasions catalog when creating your cards and projects, these stamps and accessories where designed to coordinate together. I think my little birthday card came together nicely! So a “Happy Birthday” to you if today is your day! And don’t forget … It’s Sale-a-bration! I’m sure that a nice combination of these products will warrant a FREE Sale-a-bration item of your choice. I’ve listed the supplies below for you to view.